“Harlequin Hardware” manicures created by CND‘s Candice Manacchio at the Diego Binetti show. To create these gorgeous looks, Candice stained models' nails in CND Colour in Raspberry Parfait and Frosting Cream before capping them in gold and silver metal. First I started with 2 coats of OPI Sweet Heart. Then I applied Sweet Heart and Hot or Not? on sponge and started sponging pink near the cuticles and blending pink with the lighter color. It's even messier than a normal gradient, because you need to be careful not to get pink in the middle of nails. I literally had pink fingers all around cuticles. :) Then I add just Sweet Heart on sponge and tapped it in the middle of nails in case there were pink spots. I added coat of top coat and left it for a day. Yesterday I made gold french tips with China Glaze 2030 and stripping tape and finished everything with another coat of top coat. 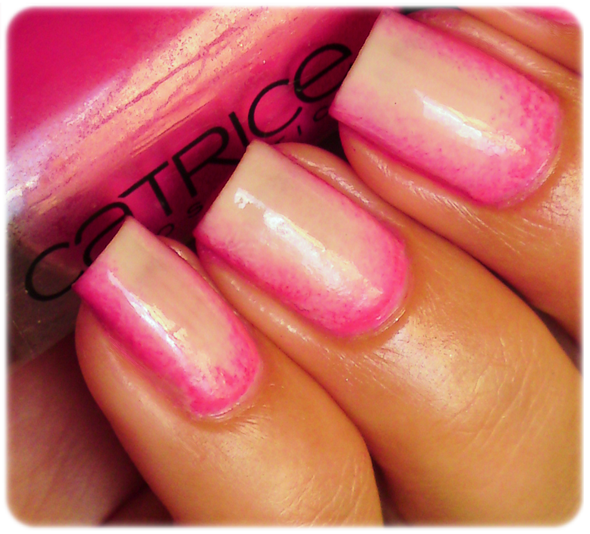 Sponging: OPI - Sweet Heart & Catrice - Hot or Not? I LOVE this! I completely want to try this out once my nails grow out :) Gorgeous girl! These are really really neat. I would totally wear them. Sometimes challenging manicures are worth the time! I wonder, if you could paint your nails the base/bright pink and then just sponge on the lighter middle with a thin sponge!? That way you're not working in the ciliticle area!? No wonder you got so many compliments on this mani! 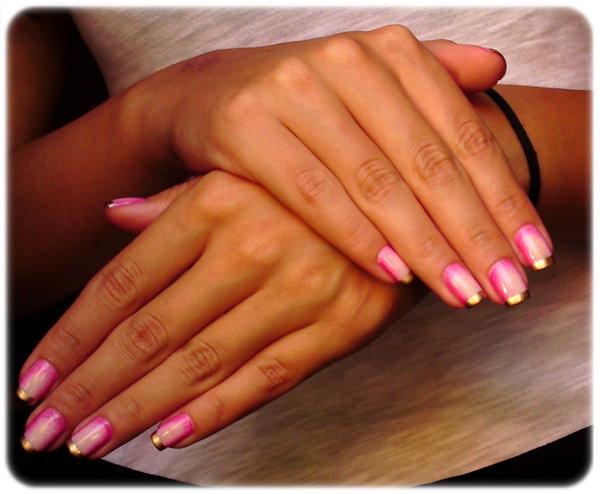 People get ripped off at salons for a mani that will be miles away from what you've created. Gorgeous! I saw this picture a while ago and saved it, but I sort of dubbed it "impossible." You did a fantastic job! I'll have to try it out. This is awesome Ivana. You did such a great job! These are beautiful! I should this out someday. wow ooodlično!!! Zbilja totalno efektno! OMG! This is probably the cutest and best done manicure I've seen! I'm so in love! I like YOURS better than the other!!! BEA-U-TI-FUL!!! you're gifted it's beautiful, really! I love that! I'll have to try this sometime! Gorgeous Ivana, I think I'll have to try this! Oooh, Ivana, this looks so awesome! I think you nailed it, and it looks better without the gold lifting in the corner! It's one of the most beautiful i have ever seen! Thanks for sharing with us! oh wow this one is unique and different had not seen this look before, must try! bet is would look nice with a pink, coral and a orange yellow. Like those pretty variegated rose petals. This looks so pretty! AMAZING!!!!!! I have a picture of this exact same manicure on my Pinterest for quite a while, and I always wanted to know how they achieved this look! Now I know how, thank you! I'm not overly fond of the original look, but I have to say yours looks way better than the inspiration! I would wear your version! So beautiful! I'm not sure I'm elegant enough to pull off the look, but it sure is pretty! Absolutely gorgeous Ivana!! I love it! Can you please do a video on how to do this look. I love the outcome!! I love this look/technique! It is so different and pretty!